In the parish church of St Radegund,Upper Austria Franz Jägerstätter was baptised; here he married and here his children were christened. Here too, from 1941 to 1943 he served as sacristan. The jung farmer and family man became one of the outstanding figures of Christian resistance to National Socialism. 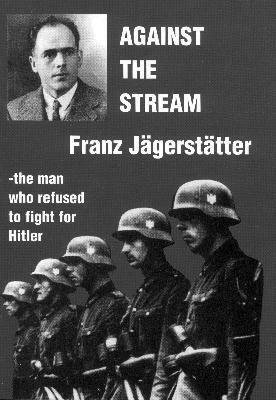 He refused not only any support for the Nazi party (NSDAP), but also declined to fight in the German army in the war started by Germany. The consequences of his decision were clear to him and his family from the start; everyone hoped that the war would end before he was called up. In the two years between his first experiences in the German army and his second call-up, he looked for a way out of the conflict of conscience between his family responsibility and his knowledge that supporting this war would involve great personal guilt. He found guidance and help in the Bible and in the example of figures such as Thomas More and Nicholas of Flüe (1st Footnote : Nicholas of Flüe, Brother Klaus 1417-1487. Swiss hermit and mystic. he left his wife Dorothea, and his ten children and lived as a hermit for 20 years. In 1481 Brother Klaus prevented a Swiss civil war. ). In his wife, Franciska, he had an understanding companion; their strong mutual relationship and love were a crucial human support in the crises before and during his imprisonment. On 20 May 1907 the unmarried farmer's maid Rosalia Huber bore a son, Franz, in St Radegund. As servants, she and the child's father, Franz Bachmeier (2labjegyzet:Franz's father was killed in the First World War), were too poor to get married. The child remained in the care of his grandmother, Elisabeth Huber, who though poor was an affectionate woman with wide interests. For seven years Franz Huber attended the primary school in St Radegund, where a teacher taught up to 70 children aged from 6 to 13 simultaneously in one room. During the First World War there was widespread hunger in that region. In retrospect, Franz felt more hurt at being disadvantaged at school as a poor child than at the hunger. When his mother married, the situation suddenly improved. She married the farmer, Heinrich Jägerstätter, who adopted his wife's child on marrying, so from February 1917 he became Franz Jägerstätter. Now, on the farm, there was enough to eat. There was reading too, because Franz's step-grandfather subscribed to a newspaper and possessed many serious books. Little Franz became an enthusiastic reader. Reading, informing oneself, he later told his godson, was very important: "People who don't read will never be able to stand on their own feet and will all too easily become a football for the opinions of others." At the age of 20, Franz Jägerstätter began three years of work in the Steiermark iron ore industry. The 500-strong community by the River Salzach in the western part of Upper Austria was known until the 1930s for its Passion plays. In 1933 they proved a failure due to Hitler's seizure of power in Germany and the subsequent closing of the border. This may partly explain why, in St Radegund in 1938, after troops marched into Austria, there were no Nazis - till then illegal - and therefore why no one wanted the post of mayor. Franz Jägerstätter was among those who were asked in March 1938 whether they would accept the office. But it was quite clear to him that any co-operation with the new rulers would be incompatible with his religious faith. Only when the appointment of a commissioner from outside was threatened did another farmer express willingness to be mayor. 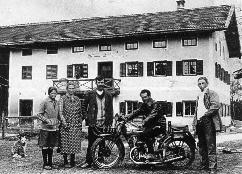 Franz Jägerstätter after his return from Steiermark; he owns the first motor cycle in the village. Left to right: his foster sister Aloisia, mother Rosalia, stepfather Heinrich Jägerstätter, Franz and a butcher who happened to be present. Later a woman denounced ten opponents of the regime to the Gestapo. The postwoman, naturally, brought the letter to the mayor. He made sure it disappeared. Among the opponents named was Jägerstätter. The Gestapo reaction to denunciations included monitoring the suspect`s mail. In Jägerstätter`s case this would soon have been productive, as his opposition was all too clear from his correspondence. In any other municipality he would have been prosecuted for "sedition". In 1940 the parish of St Radegund stood united behind the parish priest, Fr Karobath, when he was imprisoned for a "seditious" sermon. In the Diocese of Linz there was very strong Gestapo pressure on the clergy, with an exceptionally high number of murders and imprisonments. In the Deanery of Ostermiething, to which St Radegund belongs, 8 of the 12 priests were jailed, several of them friends of Jägerstätter. Two further priests, born in St Radegund, were also jailed. These experiences strengthened Jägerstätter in his rejection of National Socialism. Should he fight and kill so that it could conquer the whole world? On top of that, he learned in 1941, in Ybbs, of the fate of the mentally ill.
Franz Jägerstätter could live in freedom, until his military refusal, only with the protection of St Radegund village, but his inner reliance on his wife, Franziska, was equally important. They married in 1936. Franz was the first man in the village to take his children out in a pram and to develop a relationship with the three small children which was unusually close for that milieu. In the referendum on the Anschluss, held on 10 April 1938, Franz Jägerstätter voted No: this followed a crisis in the married couple's relationship. Franz said that he didn't want to go to the referendum, for there was scarcely a choice if the Germans were already there with their tanks. Franziska was already aware of the terror as people from every village were being taken off to concentration camps. She threatened her husband that she would no longer love him if he did not go to the referendum. Franz was alarmed, and so then was Franziska. She learned from this argument never to pressurise her husband in matters of conscience. In her letters to prison she never does, saying in the first merely that she had hoped to the end that he could have decided otherwise. In the first weeks of imprisonment at Linz in March 1943, his worst weeks, Franz Jägerstätter underwent a crisis of faith. 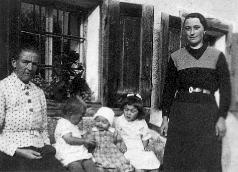 The mother and wife of Franz Jägerstätter with his three daughters, Maria, Aloisia and Rosalia. 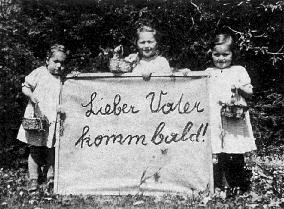 Franz Jägerstätter was called up for military service at the beginning of October 1940 and his wife sent him this photo on 3.11.40: "As a reminder of your loved ones at home" as she wrote on the back. Because of his faith, he was obliged to regard fighting in the German army as involving serious personal guilt, and was threatened with execution. In this situation, his memory of the love and happiness during seven years of marriage to Franziska helped him to resist temptation. "Who dares to assert that only one person among the German people bears the responsibility in this war?" In the summer of 1940, Franz Jägerstätter was first called up for military service and in Braunau on 17 June he was sworn in. At the instigation of the mayor, however, he was alowed to return to the farm after a few days. From October 1940 to April 1941 he was in the army, though not at the Front. When, after repeated requests from the mayor, he was listed as "indispensable" and returned to St Radegund, he announced that he would not comply with further conscription. To fight so that Hitler might conquer the whole world he saw as a matter of personal guilt and serious sin. Even the war against Russia did not ease Franz Jägerstätter's conscience. He writes: "It is very sad to hear again and again from Catholics that this war, waged by Germany, is perhaps not so unjust because it will wipe out Bolshevism. It is true that at present most of our soldiers are stuck in the worst Bolshevist country, and simply want to make harmless and defenceless the people who live there and defend themselves. But now a question: what are they fighting in this country - Bolshevism or the Russian people? When our Catholic missionaries went to a pagan country to make them Christians did they advance with machine guns and bombs in order to convert and improve them? Most of these noble warriors for Christianity wrote home that if they only had the means to hand things out, everything would go much faster... If we look back a little into history, we note almost the same thing again and again: if a conqueror attacks another country with war, they have not normally invaded the country to improve people or even perhaps give them something, but usually to get something for themselves. If we fight the Russian people, we will get much from that country which is of use to us here. If one were merely fighting Bolshevism, these others things - minerals, oil wells or good farmland - would not be a factor." It was immediately clear to everyone that conscientious objection would cost Franz his life. His mother tried through relatives to change her son's mind. Franziska spoke to him too, at the start. But as everyone tried to talk him round, as the arguments went on and he was quite alone against them all, she stood by him "If I had not stood by him, he would have had no one," she explained. "What Catholic can dare to say that these raids which Germany has carried out in several countries, and is still carrying out, constitute a just and holy war?" "Who dares to assert that among the German people in this war only one person bears the responsibility, and why then did so many millions of Germans have to give their 'Yes' or 'No'? Can one be reproached today for lacking patriotism? Do we still even have a mother country in this world? For if a country is supposed to be my mother country, it may not just impose duties - one must also have rights, and do we have rights here today? If someone becomes ineducable and might be a burden on the state, what happens to them? Would such a mother country be worth defendig at all? - which we cannot speak of anyway, because Germany was attecked by no one. Once, I believe, we would have had the right to defend ourselves, and that was four years ago when we were still Austrians." In 1946 Bishop Fliesser wrote of his conversation with Franz Jägerstätter: "I explained in vain to him the moral principles on the degree of responsibility that the private citizen has for the actions of the authorities, and reminded him of the much higher responsibility he had for those around him and particularly his family." After the war ended the bishop suppressed publication of the affair in his district. Franz Jägerstätter had sensed the bishop's fear, and his objections to war service were not weakened. Of his responsibility as the father of a family, he noted: "Again and again, people try to trouble my conscience over my wife and children. Is an action any better because one is married and has children? Is it better or worse because thousands of other Catholics are doing the same?" Jägerstätter knew that bishops and priests would be arrested if they said anything other than the government permitted. Yet he put the question: "If the Church stays silent in the face of what is happening, what difference would it make if no church were ever opened again?" 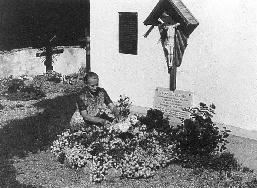 Mrs Jägerstätter at her husband's grave (1984). Franz Jägerstätter had no contact whatsoever with groups or individuals within the resistance movement. Only in the Linz military remand prison did he learn that others too had refused to do military service. As he told his wife, in a letter smuggled from the prison, this was a great encouragement to him. So was the news from prison chaplain Kreutzberg in Berlin that one year before him the Austrian priest Franz Reinisch had been a conscientious objector on the same grounds. Franz Jägerstätter was clear that he could "change nothing in world affairs" but he wished "to be at least a sign that not everyone let themselves be carried away with the tide". After he was called up, Franz Jägerstätter presented himself to the military authorities in Enns on 1 March 1943 and announced that he was refusing to fight. During March and April he was held in custody at Linz. At the beginning of May he was transferred to Berlin-Tegel. The main trial of Franz Jägerstätter took place on 6 July 1943 before the second panel of the national court martial led by Werner Lueven.- He was "condemned to death for sedition and sentenced to loss of civil rights and of eligibility for military service". Franz Jägerstätter received this picture in the Berlin prison: it brought him joy and "damp eyes". The message reads "Dear Father, come soon!" "... The accused had already been a soldier for six months, had taken the oath of loyalty to the Führer and Supreme Commander of the Army, and during his period of service was amply informed about the duties of the German soldier. Nevertheless, despite being told about the consequences of his conduct, he stubbornly refuses for personal reasons to fulfil his patriotic duty in Germany's hard struggle for survival. Accordingly, the death sentence is pronounced." The court did not respond to Jägerstätter's request to be allowed to do medical service. To the end he would have had the opportunity, like other conscientious objectors, to withdraw his objection unconditionally, and would then have been assigned immediately to a probation unit (panishment company). Early on 9 August 1943, Franz Jägerstätter was taken from Berlin to Brandenburg/Havel. At midday he was told that his death sentence had been confirmed and that it would be carried out at 4 pm. Fr Jochmann from Brandenburg spent considerable time with him and was very impressed by the condemned man's calmness and composure. On the evening of 9 August he told Austrian nuns that Franz Jägerstätter was the only saint he had met in his life. On 9 August 1943, at 4 pm, Franz Jägerstätter was beheaded, the first of 16 victims. 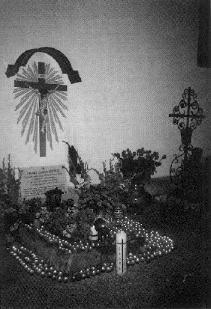 Fr Jochmann learned from the civilian crematorium and cemetery superintendent of the spot where Jägerstätter's urn was buried. 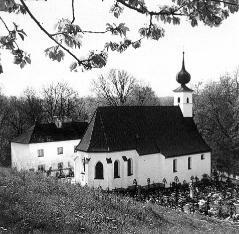 The nuns planted flowers there, and on their first trip to their mother house in Vocklabruck after the war they brought the urn containing Franz Jägerstätter's ashes to his homeland. On 9 August 1946 it was buried by the church wall in St Radegund. Many people come to St Radegund during the year, and particularly for the annual services commemorating his death on 9 August. In Franz Jägerstätter they find strength, consolation and direction. His wife still acts as sacristan. In the Diocese of Linz, preparations are being made for the canonisation of Jägerstätter, for his inclusion in the register of officially recognised models of Chirstian life. The Trustees of the Imperial War Museum, London (front cover picture of German soldiers MH 9231): Privatarchiv Jägerstätter, St Radegund (front cover picture of Franz Jägerstätter, pages 4,6, 11), R. Rinnerthaler, Salzburg (p.9), J. Mayhofer, St Radegund (p.3), Valerie Flessati London (back cover). The grave of Franz Jägerstätter on 9 August 1993 the fiftieth anniversary of his death.